- On Friday my friend Tony texted me asking if I was interested in taking part in the Chad Denning Memorial Run. Chad, who was a well respected and universally liked ultra runner/organizer died unexpectedly while trail running in 2014 along the Beaver Brook Trail. Here is a write up in Trail Runner Magazine about Chad, his accomplishments, and passing. My only interaction with Chad was a very brief one years before I started trail running. It was actually the first time I saw runners on a trail, back in 2009, him and a friend made it look so effortlessly as they approached. I stepped off the trail and figured they would just run on by, but as they came closer he and his friend slowed down and asked about my day and route. It was a short thirty second interaction, but I was impressed they took a few seconds to acknowledge my presence in the midst of their run. Now that I split time between running and hiking, I make sure I am respectful to hikers while I run, just like Chad and other runners I was fortunate to cross paths with during my hiking years of 2008-2013. - When Tony texted me I was thrilled and said yes I'd definitely join in. Soon after that, Jerimy, who organizes this fun run emailed me the details. 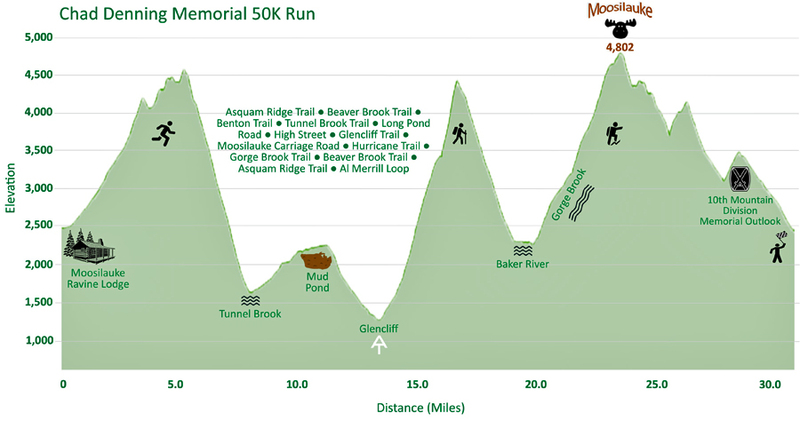 The route goes up, down, circumnavigates, goes back up and down Mount Moosilauke. It was a helluva a fun route, and since the Moose is a little bit of a drive from Gorham, it's a peak I don't get up as much as I'd like too. - I met the other runners at 7AM at the end of Moosilauke Ravine Road for the start. We started off running as a group for the first couple of miles along the Asquam-Ridge Trail. Once the trail started gaining elevation towards Mount Jim I went ahead at my own pace targeting a 7 hour 30 minute finish. Knowing full well that the fast guys, Andrew and Tristen, would catch me once they decided to part ways with the group. Only question is would they catch me on the steeps on Glencliff or could I hold them off for a little longer. - The weather was pretty good, I stayed in a tshirt all day, with my gloves on for the first dozen miles. The grades up Asquam-Ridge Trail to Mount Jim and then under Mount Blue along the Beaver Brook Trail are easy to moderate so I was able to keep a very solid uphill pace. Once I reached the junction with the Benton Trail it was a three mile descent over great footing to Tunnel Brook Road, the descents are right in my wheel house so I bombed down to the road. - Tropical Storm Irene damaged the northern section of the road beyond repair, so now the northern 2.5 miles of the road is part of the trail, Benton Trail comes out about 1.5 down the road, so I had an easy forest road run until transitioning into the woods onto the single track trail, which had easy grades and great footing up to Mud Pond beneath Mount Clough, followed by great running down to Long Pond Road where Jerimy was nice enough to stash water and treats. Here I filled up on water before continuing onto High Street to start the next uphill portion of the run. - The following three miles were up the Glencliff Trail, easy to moderate to steep grades as it makes it way to just under South Peak of Moosialuke. I slowed a bit here to save my legs, I swear I could here Andrew and Tristen close behind me but luckily they didn't quite catch up to me yet! - Once gaining the ridge I made the quick descent down the Carriage Road and across Hurricane Trail back to within an earshot of the start, here I headed left up the Gorge Brook Trail for the last major climb of the day. - As soon as the trail started gaining elevation, Andrew and Tristen caught up to me. I let them go ahead and chatted with them for the next mile as they set an great pace, faster than I would have been able to do solo, so I owe a big thanks to them for letting me tag along. After a mile I had to throttle back for the last mile to not over-do-it. Watching them pull ahead and even go faster than the previous mile pace was an amazing thing to see! - Saturday was also Flags on the 48, in honor of September 11th. Each year flags are flown from each summit on the weekend closest to the 11th. The flag was flying on top of the summit sign when I reached the top and I was able to snap a few pics before taking a very short break. Andrew was still up there and took off, I then took off soon after with Tristen close behind. As I made my way to the Beaver Brook / Asquam-Ridge junction I spotted an A.T. NOBO guide off the side of the trail on the backside of a rock, I picked it up and made a detour off the route and headed quickly down to the Beaver Brook Shelter. I was going to leave a note in the lean-to asking for someone to try and get this to its owner, luckily when I reached the spur for the shelter I ran into the thru-hiker who didn't even know he left it behind, he was very thankful to say the least. I then scooted back up to the trail junction, this little side trip cost me about ten minute and 0.8 miles, so it was no big deal at all since I was well on my way to my goal of 7 hours 30 minutes, and could still even squeak in under 7 hours so I set my sights on that. - Once back on the Asquam-Ridge Trail I realized how mossy the trail was, no problem on the ascent in the morning but very tedious on the descent in the afternoon, I even had a nasty fall, albeit I was unscathed. - After two miles the route makes one last turn onto the Al Merrill Loop, this comes with one last uphill punch, a quick 400 foot climb that feels like it's never ending! Luckily, it quickly reaches the height of land and descends over a nice old logging road that is built for speed. After huffing and puffing up to the top of the hill I bombed down the trail to the finish, coming in at 6 hours 59 minutes 20 seconds! Andrew and Tristen finished strong at 6 hours 43 minutes, impressive! - There was a lot going on at the trailhead, the Ravine Lodge and bunkhouses were recently rebuilt, the road is quite a mess, and some of the paths to and from the lodge are a little wonky so the DOC (Dartmouth Outing Club) were out and about doing trail work and maintenance. - I headed to my car and cleaned the mud and sweat off of me, put on clean clothes and relaxed until the others came rolling on in. We all gathered off to the side of the road and had some cold beverages and stuffed our faces while socializing for awhile before heading our separate ways. - It was a great way to spend a Saturday running in the mountains in remembrance of Chad. I'm thankful to have been invited and look forward to running it again and hanging out post run next summer. High Street, pounding pavement is never fun! Fun trip - I bet you flew down the Benton Trail! Haha, I wish that was the case. What makes it worse is that it was right at the top of the page and I missed it!